A blockbuster Travers Day card, highlighted by Catholic Boy’s victory in the 149th running of the Grade 1, $1.25 million Runhappy Travers, generated all-sources handle of $52,086,597, shattering the previous record set in 2015 by 4.9 percent. All-sources handle, which exceeded the $50 million mark on Travers Day for the first time ever, surpassed the 2017 all-sources number by 8.8 percent. On-track handle was $11,466,264, an increase of 5.6 percent over 2017, and just shy of 2015’s $11,472,451. A paid crowd of 49,418 witnessed Catholic Boy put away European invader Mendelssohn in the stretch to draw clear for a four-length victory in the Runhappy Travers, giving Hall of Fame jockey Javier Castellano his record sixth victory in the race. The Runhappy Travers was one of six Grade 1 stakes on Travers Day, which also featured the Grade 1, $1 million Sword Dancer, the Grade 1, $700,000 Personal Ensign, the Grade 1, $600,000 Forego, the Grade 1, $500,000 Ketel One Ballerina and the Grade 1 $500,000 H. Allen Jerkens presented by Runhappy. 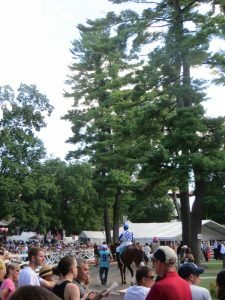 The Travers Day card was rounded out by the Grade 2, $400,000 Woodford Reserve Ballston Spa. full field of 14 in the 65th running of the Grade 1, $750,000 Woodward – generated an all-sources handle record of $31,030,034, easily eclipsing the previous Woodward Day record set in 2017 by 11.3 percent. 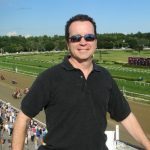 Woodward Day also featured Raging Bull’s impressive win in the 111th running of the Grade 3, $300,000 Saranac, part of an effort that saw Chad Brown set a new Saratoga single-meet wins records for a trainer, with the conditioner eclipsing the previous mark of 40. Sippican Harbor, at odds of 16-1, won the Grade 1, $350,000 Spinaway and earned an all-fees paid berth to the Breeders’ Cup Juvenile Fillies. Following Yoshida’s win in his dirt debut, Lady Montdore ended the day with a victory in the Grade 2, $250,000 Glens Falls.